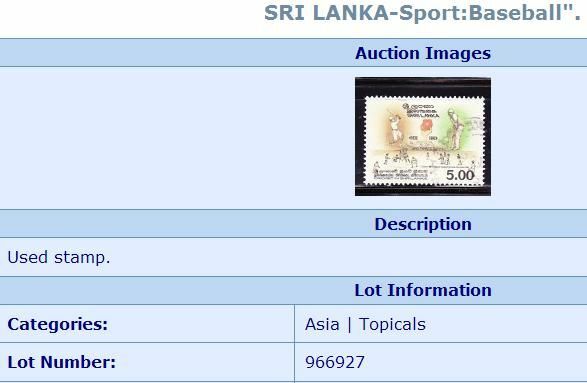 Top tip for those of you who collect cricket stamps: search for baseball as well. I've lost count of the number of times I've seen cricket stamps listed under baseball. This is the most recent; saw it this morning. It commemorates 160 years of cricket in Sri Lanka/Ceylon. The giveaway would appear to be the red ball, the batting pads strapped on over the trousers, and the 5 fielders standing in position behind the batsman - well, that and the fact that it says CRICKET in large friendly letters in the bottom left-hand corner. I never cease to be amazed that so often the culprits seem to be dealers in the US. I understand that they might not recognise cricket; but surely they know their own national sport well enough to realise that it is not being depicted? I mean, I don't see lot of Canadian dealers mis-advertising badminton stamps as lacrosse! What is a testimonial year?